Do You Know the History of These Popular Farm Idioms? "Don't have a cow" has been around for far longer than Bart Simpson. 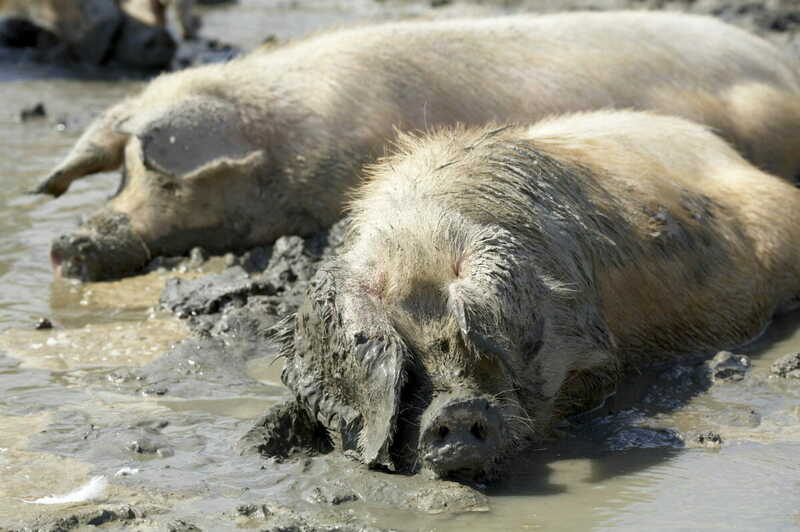 Do you know where the phrase "happy as a pig in mud" comes from? Sure, we all know why “separate the wheat from the chaff” means dividing bad from good, but some of their other finds are fascinating. For example, did you know that examining an animal’s teeth could be considered rude? Find a few favorites below. For the full list, head to Merriam-Webster’s original post. Definition: To become very angry, upset, etc. The dictionary assures us that this phrase predates Bart Simpson. It’s been in use since the mid-1900s and actually originates from a British expression, “to have kittens,” which indicated nervousness more than anger. Maybe cows are more rageful than kittens? Hmm. The first known use of this idiom was in 1549, based on the idea that looking closely at a horse’s teeth could be considered rude, since that would reveal its age. Probably ruder with a person, but you get the idea. Why this means what it does seems obvious – your pig will literally never fly – but why pigs, specifically? Why not any other animal flightless animal? The dictionary doesn’t get to the bottom of this, unfortunately, but does find that this idiom used to be quite specific. In writings from 1581, the phrase was “when pigs fly with their tails forward.” We guess technically that would be even less likely than pigs flying in general, but it seems like an unnecessary add. This story we published in 2014 will tell you the tale of Mike the Headless Chicken, who lived for 18 months after his decapitation. That, of course, is not the norm; this saying comes from a more common result of a chicken beheading – if you aim the hatchet too high, the brain will be sliced in a way that the bird can still run around for a few seconds after the kill. In the 1800s, a writer for the New Orleans Times-Picayune compared a person hopping around excitedly to a floundering headless bird, and an idiom was born. Another day, another pig idiom. What we love about this one is how many variations on “mud” there have been over the years, based on all the things that make pigs happy. Sub in “muck,” “puddle” or even “clover” and this phrase means the same thing. Pigs, always happy! We should all learn from them. Merriam-Webster also put together this fun quiz of farm idioms, if you’re up for it. Good luck!